"Vlach", "Wallach", and "Oláh" redirect here. For other uses, see Vlach (disambiguation), Wallach (disambiguation), and Oláh (disambiguation). Not to be confused with Vlaams. Map depicting the current distribution of Eastern Romance-speaking peoples in the Balkans. Vlachs (English: /ˈvlɑːk/ or /ˈvlæk/, or rarely /ˈvlɑːx/), also Wallachians (and many other variants), is a historical term from the Middle Ages that designates an exonym—a name that foreigners use—mostly for the Romanians who lived north and south of the Danube. As a contemporary term, in the English language, the Vlachs are the Eastern Romance-speaking peoples who live south of the Danube in what are now eastern Serbia, southern Albania, northern Greece, the Republic of North Macedonia, and southwestern Bulgaria, as indigenous ethnic groups, such as the Aromanians, Megleno-Romanians (Macedoromanians), and Macedo-Vlachs. In Polish and Hungarian, derivations of the term were also applied to Italians. The term also became a synonym in the Balkans for the social category of shepherds, and was also used for non-Romance-speaking peoples, in recent times in the western Balkans derogatively. There is also a Vlach diaspora in other European countries, especially Romania, as well as in North America and Australia. "Vlachs" were initially identified and described during the 11th century by George Kedrenos. According to one origin theory, modern Romanians, Moldovans and Aromanians originated from Dacians. According to some linguists and scholars, the Eastern Romance languages prove the survival of the Thraco-Romans in the lower Danube basin during the Migration Period and western Balkan populations known as "Vlachs" also have had Romanized Illyrian origins. Nowadays, Eastern Romance-speaking communities are estimated at 26–30 million people worldwide (including the Romanian diaspora and Moldovan diaspora). All Balkan countries have indigenous Romance-speaking minorities. The word Vlach/Wallachian (and other variants such as Vlah, Valah, Valach, Voloh, Blac, Oláh, Vlas, Ilac, Ulah, etc.) is etymologically derived from the ethnonym of a Celtic tribe, adopted into Proto-Germanic *Walhaz, which meant "stranger", from *Wolkā- (Caesar's Latin: Volcae, Strabo and Ptolemy's Greek: Ouolkai). Via Latin, in Gothic, as *walhs, the ethnonym took on the meaning "foreigner" or "Romance-speaker", and was adopted into Greek Vláhi (Βλάχοι), Slavic Vlah, Hungarian oláh and olasz, etc. The root word was notably adopted in Germanic for Wales and Walloon, and in Switzerland for Romansh-speakers (German: Welsch), and in Poland Włochy or in Hungary olasz became an exonym for Italians. Historically, the term was used primarily for the Romanians. Testimonies from the 13th-14th centuries show that, although in the European (and even extra-European) space they were called Vlachs or Wallachians (Oláh in Hungarian, Vláchoi (βλάχοι) in Greek, Volóxi (воло́хи) in Russian, Walachen in German, Valacchi in Italian, Valaques in French, Valacos in Spanish), the Romanians used for themselves the endonym "Rumân/Român", from the Latin "Romanus" (in memory of Rome). Via both Germanic and Latin, the term started to signify "stranger, foreigner" also in the Balkans, where it in its early form was used for Romance-speakers, but the term eventually took on the meaning of "shepherd, nomad". The Romance-speaking communities themselves however used the endonym (they called themselves) "Romans". During the early history of the Ottoman Empire in the Balkans, there was a social class of Vlachs in Serbia and Ottoman Macedonia, made up of Christians who served as auxiliary forces and had the same rights as Muslims. In Croatia, the term became derogatory, and Vlasi was used for the ethnic Serb community who, despite being Slavic, were given the term due to the Orthodox faith which they shared with the Vlachs. Romanian scholars have suggested that the term Vlach appeared for the first time in the Eastern Roman Empire and was subsequently spread to the Germanic- and then Slavic-speaking worlds through the Norsemen (possibly by Varangians), who were in trade and military contact with Byzantium during the early Middle Ages (see also Blakumen). Nowadays, the term Vlachs (also known under other names, such as "Koutsovlachs", "Tsintsars", "Karagouni", "Chobani", "Vlasi", etc.) is used in scholarship for the Romance-speaking communities in the Balkans, especially those in Greece, Albania and North Macedonia. In Serbia the term Vlach (Serbian Vlah, plural Vlasi) is also used to refer to Romanian speakers, especially those living in eastern Serbia. Aromanians themselves use the endonym "Armãn" (plural "Armãni") or "Rãmãn" (plural "Rãmãni"), etymologically from "Romanus", meaning "Roman". Megleno-Romanians designate themselves with the Macedonian form Vla (plural Vlaš) in their own language. Byzantine historians used the term Vlachs for Latin speakers. The 7th century Byzantine historiographer Theophylact Simocatta wrote about “Blachernae” in connection with some historical data of the 6th century, during the reign of Byzantine Emperor Maurice. First precise data about Vlachs are in connection with the Vlachs of the Rynchos river; the original document containing the information is from the Konstamonitou monastery. During the late 9th century the Hungarians invaded the Carpathian Basin, where the province of Pannonia was inhabited by the "Slavs [Sclavi], Bulgarians [Bulgarii] and Vlachs [Blachii], and the shepherds of the Romans [pastores Romanorum]" (sclauij, Bulgarij et Blachij, ac pastores romanorum —according to the Gesta Hungarorum, written around 1200 by the anonymous chancellor of King Béla III of Hungary. George Kedrenos mentioned about Vlachs in 976. The Vlachs were guides and guards of Roman caravans in Balkans. Between Prespa and Kastoria they met and fought with a Bulgarian rebel named David. The Vlachs killed David in their first documented battle. Mutahhar al-Maqdisi, "They say that in the Turkic neighbourhood there are the Khazars, Russians, Slavs, Waladj, Alans, Greeks and many other peoples." Byzantine writer Kekaumenos, author of the Strategikon (1078), described a 1066 revolt against the emperor in Northern Greece led by Nicolitzas Delphinas and other Vlachs. The names Blakumen or Blökumenn is mentioned in Nordic sagas dating between the 11th–13th centuries, with respect to events that took place in either 1018 or 1019 somewhere at the northwestern part of the Black Sea and believed by some to be related to the Vlachs. The Russian Primary Chronicle, written in ca. 1113, wrote when the Volochi (Vlachs) attacked the Slavs of the Danube and settled among them and oppressed them, the Slavs departed and settled on the Vistula, under the name of Leshi. The Hungarians drove away the Vlachs and took the land and settled there. Map of Central-Southern Europe during the late Middle Ages/early Modern period by Transylvanian Saxon humanist Johannes Honterus. Traveler Benjamin of Tudela (1130–1173) of the Kingdom of Navarre was one of the first writers to use the word Vlachs for a Romance-speaking population. Byzantine historian John Kinnamos described Leon Vatatzes' military expedition along the northern Danube, where Vatatzes mentioned the participation of Vlachs in battles with the Magyars (Hungarians) in 1166. The uprising of brothers Asen and Peter was a revolt of Bulgarians and Vlachs living in the theme of Paristrion of the Byzantine Empire, caused by a tax increase. It began on 26 October 1185, the feast day of St. Demetrius of Thessaloniki, and ended with the creation of the Second Bulgarian Empire, also known in its early history as the Empire of Bulgarians and Vlachs. In 1213 an army of Romans (Vlachs), Transylvanian Saxons, and Pechenegs, led by Ioachim of Sibiu, attacked the Bulgars and Cumans from Vidin. After this, all Hungarian battles in the Carpathian region were supported by Romance-speaking soldiers from Transylvania. At the end of the 13th century, during the reign of Ladislaus the Cuman, Simon de Kéza wrote about the Blacki people and placed them in Pannonia with the Huns. Archaeological discoveries indicate that Transylvania was gradually settled by the Magyars, and the last region defended by the Vlachs and Pechenegs (until 1200) was between the Olt River and the Carpathians. Shortly after the fall of the Olt region, a church was built at the Cârța Monastery and Catholic German-speaking settlers from Rhineland and Mosel Valley (known as Transylvanian Saxons) began to settle in the Orthodox region. In the Diploma Andreanum issued by King Andrew II of Hungary in 1224, "silva blacorum et bissenorum" was given to the settlers. The Orthodox Vlachs spread further northward along the Carpathians to Poland, Slovakia, and Moravia and were granted autonomy under Ius Vlachonicum (Walachian law). In 1285 Ladislaus the Cuman fought the Tatars and Cumans, arriving with his troops at the Moldova River. A town, Baia (near the said river), was documented in 1300 as settled by the Transylvanian Saxons (see also Foundation of Moldavia). In 1290 Ladislaus the Cuman was assassinated; the new Hungarian king allegedly drove voivode Radu Negru and his people across the Carpathians, where they formed Wallachia along with its first capital Câmpulung (see also Foundation of Wallachia). In addition to the ethnic groups of Aromanians, Megleno-Romanians, and Istro-Romanians who emerged during the Migration Period, other Vlachs could be found as far north as Poland, as far west as Moravia and Dalmatia. In search of better pasture, they were called Vlasi or Valaši by the Slavs. Terra Prodnicorum (or Terra Brodnici), mentioned by Pope Honorius III in 1222. Vlachs led by Ploskanea supported the Tatars in the 1223 Battle of Kalka. Vlach lands near Galicia in the west, Volhynia in the north, Moldova in the south and the Bolohoveni lands in the east were conquered by Galicia. Bolokhoveni was Vlach land between Kiev and the Dniester in Ukraine. Place names were Olohovets, Olshani, Voloschi and Vlodava, mentioned in 11th-to-13th-century Slavonic chronicles. It was conquered by Galicia. 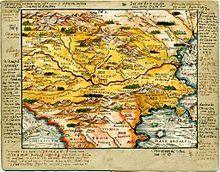 An Italian writer called the Banat Valachia citeriore ("Wallachia on this side") in 1550. Moravian Wallachia (Czech: Moravské Valašsko), in the Beskid Mountains (Czech: Beskydy) of the Czech Republic. Detailed map depicting Vlach transhumance in the Western Balkans, showcasing several examples of Vlach necropolises. As national states appeared in the area of the former Ottoman Empire, new state borders were developed that divided the summer and winter habitats of many of the pastoral groups. 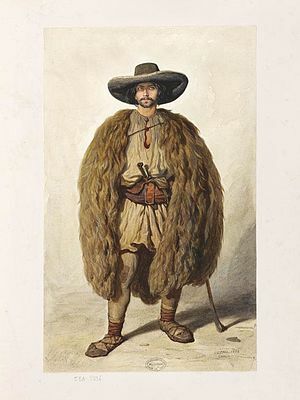 During the Middle Ages, many Vlachs were shepherds who drove their flocks through the mountains of Central and Eastern Europe. Vlach shepherds may be found as far north as southern Poland (Podhale) and the eastern Czech Republic (Moravia) by following the Carpathians, the Dinaric Alps in the west, the Pindus Mountains in the south, and the Caucasus Mountains in the east. The medieval Vlachs have elevated decorated funerary monuments in Herzegovina (Radimlja, Boljuni, Blidinje, etc) and surrounding countries. The Vlach origin of tombstones was attested by Bogumil Hrabak (1956) and Marian Wenzel (1962) and by the archeological and anthropological researches of skeleton remains from the graves under stećci. ^ a b c d e Ioan-Aurel Pop. "On the Significance of Certain Names: Romanian/Walllachian and Romania/Wallachia" (PDF). Retrieved 18 June 2018. ^ "Valah". Dicționare ale limbii române. dexonline.ro. Retrieved 18 June 2018. ^ a b Peter F. Sugar (1 July 2012). Southeastern Europe under Ottoman Rule, 1354-1804. University of Washington Press. p. 39. ISBN 978-0-295-80363-0. ^ a b c d e Tanner 2004, p. 203. ^ Fine 1991, p. ? : "Traditionally scholars have seen the Dacians as ancestors of the modern Rumanians and Vlachs." ^ According to Cornelia Bodea, Ştefan Pascu, Liviu Constantinescu: "România: Atlas Istorico-geografic", Academia Română 1996, ISBN 973-27-0500-0, chap. II, "Historical landmarks", p. 50 (English text), the survival of the Thraco-Romans in the Lower Danube basin during the Migration period is an obvious fact: Thraco-Romans haven't vanished in the soil & Vlachs haven't appeared after 1000 years by spontaneous generation. ^ Badlands-Borderland: A History of Southern Albania/Northern Epirus [ILLUSTRATED] (Hardcover) by T.J. Winnifruth, ISBN 0-7156-3201-9, 2003, page 44: "Romanized Illyrians, the ancestors of the modern Vlachs". ^ "Council of Europe Parliamentary Recommendation 1333 (1997)". Assembly.coe.int. 24 June 1997. Retrieved 8 February 2013. ^ Ringe, Don. "Inheritance versus lexical borrowing: a case with decisive sound-change evidence." Language Log, January 2009. ^ a b c Juhani Nuorluoto; Martti Leiwo; Jussi Halla-aho (2001). Papers in Slavic, Baltic, and Balkan studies. Dept. of Slavonic and Baltic Languages and Literatures, University of Helsinki. ISBN 978-952-10-0246-5. ^ Entangled Histories of the Balkans: Volume One: National Ideologies and Language Policies. BRILL. 13 June 2013. pp. 42–. ISBN 978-90-04-25076-5. ^ H. C. Darby (1957). "The face of Europe on the eve of the great discoveries". The New Cambridge Modern History. 1. p. 34. ^ Ilie Gherghel, Câteva considerațiuni la cuprinsul noțiunii cuvântului "Vlach", București: Convorbiri Literare, 1920, p. 4-8. ^ A. Decei, op. cit., p. 25. ^ K. HOREDT, Contribuţii la istoria Transilvaniei în secolele IV-XIII, Bucureşti, 1958, p.109-131. IDEM, Siebenburgen im Fruhmittelalter, Bonn, 1986, p.111 sqq. ^ A. IONIŢĂ, Date noi privind colonizarea germană în Ţara Bârsei şi graniţa de est a regatului maghiar în cea de a doua jumătate a secolului al XII-lea, în RI, 5, 1994, 3-4. ^ Map of Yugoslavia, file East, sq. B/f, Istituto Geografico de Agostini, Novara, in : Le Million, encyclopédie de tous les pays du monde, vol. IV, ed. Kister, Geneve, Switzerland, 1970, pp. 290-291, and many other maps & old atlases - these names disappear after 1980. ^ Mircea Mușat; Ion Ardeleanu (1985). From Ancient Dacia to Modern Romania. Editura Științifică și Enciclopedică. that in 1550 a foreign writer, the Italian Gromo, called the Banat "Valachia citeriore" (the Wallachia that stands on this side). ^ Mužić, Ivan (2009). "Vlasi i starobalkanska pretkršćanska simbolika jelena na stećcima". Starohrvatska prosvjeta (in Croatian). Split: Museum of Croatian Archaeological Monuments. III (36): 315–349. Birgül Demirtaş-Coşkun; Ankara University. Center for Eurasian Strategic Studies (2001). The Vlachs: a forgotten minority in the Balkans. Frank Cass. Arno Tanner (2004). The Forgotten Minorities of Eastern Europe: The History and Today of Selected Ethnic Groups in Five Countries. East-West Books. pp. 203–. ISBN 978-952-91-6808-8. Victor A. Friedman, "The Vlah Minority in Macedonia: Language, Identity, Dialectology, and Standardization" in Selected Papers in Slavic, Balkan, and Balkan Studies, ed. Juhani Nuoluoto, et al. Slavica Helsingiensa:21, Helsinki: University of Helsinki. 2001. 26-50. full text Though focussed on the Vlachs of North Macedonia, has in-depth discussion of many topics, including the origins of the Vlachs, their status as a minority in various countries, their political use in various contexts, and so on. Ilie Gherghel, Câteva consideraţiuni la cuprinsul noţiunii cuvântului "Vlach". Bucuresti: Convorbiri Literare,(1920). G. Weigand, Die Aromunen, Bd.Α΄-B΄, J. A. Barth (A.Meiner), Leipzig 1895–1894. A. Keramopoulos, Ti einai oi koutsovlachoi [What are the Koutsovlachs? ], publ 2 University Studio Press, Thessaloniki 2000. A. Koukoudis, Oi mitropoleis kai i diaspora ton Vlachon [Major Cities and Diaspora of the Vlachs], publ. University Studio Press, Thessaloniki 1999. Franck Vogel, a photo-essay on the Valchs published by GEO magazine (France), 2010. Look up Vlach in Wiktionary, the free dictionary. Wikimedia Commons has media related to Vlachs. Wikisource has the text of the 1911 Encyclopædia Britannica article Vlachs.